Part of my online business model is creating and selling turnkey websites that run on wordpress. Such as these: PLR Websites, Digital Turnkey Stores. 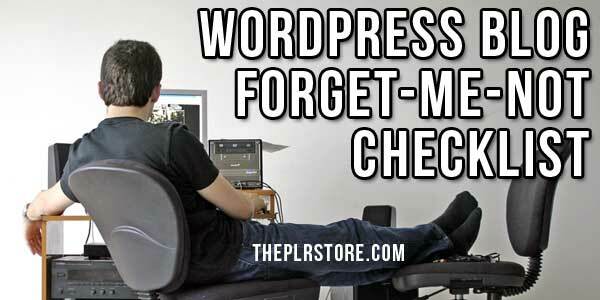 Although I’ve setup 100’s of wordpress sites, without fail, it seems like I always forget something. That or I am just getting old and the brain cells are far and few between? So, I thought Hey, why don’t I create a checklist for myself, so I don’t forget anything important. Then I thought Hey, maybe others could use it as well! And you’re probably thinking Hey, ya I could use that! Obviously some of these are common sense or no-brainers, but I figured it would be best to cover every single part and piece I could think of. I don’t know about you, but I often forget the easy and simple things as well as the big and important ones. This is an obvious one, but I thought I’d cover a few things. First off, don’t be a theme switcher like me. I am real bad at installing one theme, taking the time to set it up, then I see another one I “think” I like better. Now if it’s a brand new site, changing theme’s won’t be too big a deal, but start getting traffic to it and you’re probably going to confuse your visitors. Red pill? blue pill? One of the questions I see come up on the forums pertaining to wordpress the most often is, “Which Theme is best?”. Or, “Which theme should I use?”. How the heck can anyone know the answer to that? How about a blue one? Pink one? Hybrid? Hotrod? Not to mention we all have different tastes. I am no expert, but the best suggestion I can give is to write down exactly what you want your blog to do, or how you’d like it to look, function, or what features it needs to include. Make sure the theme you choose it also mobile friendly and responsive on all devices. Must have these days. A blog without comments is a ghost town. Least in my opinion. It can also go to show social proof, visitors might think that you just might know what you’re talking about, how you interact with others (actually quite important), give you the opportunity to show off your personality and so much more. Make sure you have a system set up and that it works properly. And for the sanity of your visitors and commenters, install one that is easy to use. I was on a blog the other day, every time I replied to a previous comment, I was bounced to the bottom of the page, so I couldn’t see or re-read the comment I was replying to. It’s kind of frustrating. On another note, you might want to think twice before you lock in your comments to only one platform. I know some blogs have Facebook only comments, but some folks don’t want to link up their facebook account, I am one of those and I know of others who feel the same. Don’t get me wrong, places like Facebook are huge when it comes to potential traffic. I am NOT saying you should NOT use this tactic, I am only saying be prepared that you might lose some comments and you might get some flack about it. Just something to keep in mind. One last thing, be decisive. I say that because switching systems can wipe out an old one. For example, I had wordpress comments on my blog, but switching to Disqus, stripped out all the links in old comments and the Gravatars no longer work on previous comments. Let’s just say, my old comments don’t look so pretty. Another no brainer, but it has to be said and a couple thoughts on the subject. There are so many social button plugins these days, many free, so there is NO excuse not to use them. I was on a blog the other day that only has social share buttons at the top of their articles, like right under the title. Now, if you think about it for a millisecond, the visitor has not read the content yet, so they probably don’t know if they want to share it “yet”. Not saying it’s a bad idea to have them up top, but you do need them down at the bottom as well. Better yet, what “seems” to be the best is the floating bar to the side. I have not tested this yet (trying to figure out how), but it makes sense. No matter where the reader is, the share buttons are right there, ready and easy to click. No mess no fuss, no scrolling up and down. How many people do you think will scroll around to “find” your share links? Odds are probably not many. Don’t make readers work to find them. While most folks put up social buttons on their blog, quite a few actually miss the follow buttons. I am talking about those ones where your visitors can click to follow you on each social platform. Obviously, This is important because it is another way to get those precious visitors back to your blog. It is also a way to get people in your circle, build social signals and get them in “your” world. Instead of chasing followers down, why not let them come to you? I can tell you from experience, it’s ALOT less work. Another option that’s come about the last couple years are the buttons that show the actually number of shares, or how many times the buttons have been clicked. Same goes for followers, where the count is shown for each social site. Thing is, if your blog is new, or you don’t have traffic yet, you might want to turn that option off. We don’t want to remind visitors, or show them that you don’t have the hits. Right? It’s all about perception. But of course, if you’re getting shares, turn on the counts and show off. I’ll admit I was late to the party on this one. That is, using a plug-in which lets you designate a certain text or multiple text snippets as links that when clicked will post the given content to the visitors Twitter account. Honestly I think I was a little reluctant because it seemed like I would be tooting my own horn. Like, “Dude this sentence I wrote is so frickin awesome you must share it” kind of thing. Like people who call THEMSELVES experts. But we need to step out of our comfort zone and do some self promotion if we hope to get ahead. It’s all good. Sadly wordpress blogs are prime targets for hackers. It’s like windows operating systems, there are so many users, it’s a big market for the bad guys. Oddly some people seem to think they won’t get hacked. Not good my friend. I think of it this way, it’s not “if” you get hacked, it’s “when” you get hacked. Use to be they targeted sites that had traffic or income they could siphon off, but the new tactic is to use sites to send phishing emails and setting up phishing pages. It happens to all sites big and small. I am not a security expert, so I’ll end it here, just to say these days it is a necessary plugin. Before I give my personal choice, I wanted to note that I’ve tried others. One that comes to mind is iThemes Security. The one thing I did not like about it is that it blocked login’s when there was repeated attempts to log in. Problem is, if it was your main login, you could be locked out of your blog. There might be a setting to change this, I have not investigated that far, just something I noticed. The hackers are not the only ones that want a piece of your site, spammers are the veterans, they’ve been taking advantage of wordpress sites for many years. Since most security systems take care of the bad stuff, comment spam is what’s left. The easy way to stop the comment spam is to use a good comment system. Ones like Disqus, or Comment LUV can take of it for you. Now, if your still using the default wordpress comment system or similar, I am not much help. Gee, thanks alot huh? These days my comment system stops my spam for me. And plugins I’ve used in the past stopped working. Let’s face it, stuff happens. Sometimes we delete stuff by accident. Or we switching hosting and forget something. I’ve done that. Ouch. Our hosting services are not always perfect either. We’ve all heard the horror stories. Sites or blogs getting deleted. Things going missing. Doesn’t happen very often, but it does happen. Or we get hacked and discover we don’t have the original files. I don’t currently have a plug-in recommendation, as I am still exploring some options. There is one thought though, we should always have all our site files on our computer. As I’ve mentioned before, when we use WordPress, we can get lazy and install theme’s or plugins in the dashboard. It’s so easy, right? But when we do that, we don’t have the files on our home computer. Not super important, but it should be a necessary part of any blog. Often readers might have a question about a product or service you’ve blogged about, or they might need some reassurance something works, or even validation that you’re a real person behind the blog. Without a contact form, how will they get in touch. Could be lost sales or income. Other bloggers might want to ask you to guest post on their blog. Missing opportunities. Over the years I’ve lost count how many people have contacted me with a question or two, and after I help them, they place an order or buy something from me. I believe many times it’s just the fact that you show you are a real person behind the site, product or service. I personally prefer Gravity Forms, but it’s not for everyone and so people don’t want to spend money on their business. You could create content to your fingers bleed and comment on every other blog you could find, but to really grow a stable source of traffic, you need to build a list. No questions. Ya, you probably already know this. An easy and simple way to build a band of fans is to use a “Subscribe to blog” option. This is where your visitors can sign up to get emails when you put up a new blog post. It’s not exactly “your” list, but it’s something. It’s a start. The plug-in I use is Jetpack. What’s nice about this is that the subscriptions go through WordPress.com. It’s good because WordPress.com is a huge trusted site, which means, those emails have a very good chance of getting through to your subscribers and more importantly, they will be more likely to hit the Inbox and not the junk, trash or promotional folders. Some would argue you should use your own autoresponder service, ones like Aweber. Not saying they are wrong, I am only saying, that deliverability will probably be better with the former option. Again, something to keep in mind. your choice. On the other hand, using a service like Aweber, you have more ownership of the list and you could send more that updates notices. Obviously, there are also other several tool you can use to build a list. I am not going to go on about the subject because there are so many options and everyone has their own opinion, likes, dislikes, ect. The main point is, if you want steady traffic in your business, you need to build a list. Also, you need to communicate with your subscribers on a regular basis. If you want to extract the maximum profits from your list, be sure to check out these: Email Marketing Gold Vault. The money can be in a list, but only if you know how to use your list. My current Recommendation is Thrive Leads. There are a number if options to speed up your site. First is a caching plugin. Or a combination of plugins. Another aspect is you optimize your images. On a side note, sometimes, sometimes, no matter what you do to your site, no matter the plugin you add, your sites slowness might be your hosting. I know all too well because I recently changed hosts because of the slow speed. Just changing where my websites were hosted raised my speed score by 8 points. Granted it’s not a huge jump, but it’s a good bump and every little bit helps. I am not saying to dump your current host, but it’s something you need to check. Current Speedy my site up plugin’s are a combination of: W3 Total Cache and Autoptimize. I must put up a disclaimer before we continue. Okay? It’s very easy to go plugin crazy. There are so many “cool” things you can add to your blog and if your techie like me, you like having cool stuff on your blog. Remember, every plug-in you add, could reduce your blogs load time or draw more server resources. So, none of these are necessary, but might be useful. Just be careful your don’t bog your blog down. I wanted to mention these additions because I believe they can be very useful. Also referred to as a Sticky Widget. With this plugin, you can set some of your sidebar widgets so they always show in the side bar. They “stick” there no matter how much your reader scrolls. It’s useful for bloggers who create long posts. With long posts, the sidebar ends up with so much empty space. So why not keep something there all the time? Like advertisements or Optin forms. A blog sidebar by default usually has a one set of properties. Meaning you can only have one side bar. Obviously, this type of plugin Allows you to choose a given sidebar per page or post. Many new themes already have this feature built in, there are plug-in options to achieve the same purpose. With unlimited sidebars you can create new sidebar setups. The beauty here is that you can better target your advertising. Say your page or post is about email marketing, in this example, you could apply a sidebar that has only, or mainly, email related advertising and links, giveaways ect. People are likely reading your page or post because it’s something they are interested in, so why not show ads that target their interest? Think you might have higher click thru rates and higher conversion? Umm.. ya I think so. I don’t currently have a recommendation because most of the theme’s I use have this feature built in. Sorry. Here’s another very useful type of plugin that comes in handy in a couple ways. It’s allows you to take ugly affiliate links for example, and turn them into something like: yoursite.com/super-product.html. Of course it can be used on any link, affiliate or your own. First off it makes your links look MUCH less like a money link. Which I believe can help increase click thru. Might not be much in reality, but every hit counts right? The other advantage is that with the right plugin you can see the clicks your links get. Data like this can be used to determine the best traffic sources, or who sends the most hits. One could create specific links for specific traffic sources and track the results. One could have multiple links going to the same end target url. Most importantly, in my opinion with this type of plugin, is that you can change the target url at will if you need to. Say an affiliate program your using goes out of business, disappears (hopefully not with your commissions), or they just stop selling a certain product or service. It actually happens quite often. When you use a plugin like this, you can change the target link and instantly, every link you’ve put up changes as well. This is even more useful for links off site, such as links in PDF’s or ebooks. See the power here? If one was smart, they would use this for every link they put in their PDF’s, content, ebooks, reports, ect. So they have the ability to change links as needed, when needed. It is one of the few ways to control outside links. Here’s something SO many bloggers miss out on, tracking their advertisements. Yes, I’ve been guilty myself. For most bloggers, they pick ads or banners they think will do best, or ones they like and that’s it. I’ve done it. Pretty doesn’t always sell though. But… what most do not realize is that click thru rates for banners or ads can vary SO greatly. We only have so much traffic, right? Since this is a fact, it’s only in our best interest to squeeze every penny out of every visitor as possible, right? Don’t mean to sound crass, but that was the best way I could think to drive the point home. No squeezing people, okay? You could be leaving money on the table if you do not test and track your ads so you can discover exactly which ones pull the highest clicks. I am not going to get into the numbers because I already did it in this post: Advanced Guide To Internet Marketing. It’s amazing how many blogs I see with things that don’t work. Hey, I’ve been there as well. Actually have a few things to fix on a couple of my blogs right now. If you’re like me, you can get caught up in all the cool stuff you can do to your blog, and it’s way too easy to end up with 50 plug-ins and a slow site. I’ve done it, and I am not the only one. Over to you. Did I miss something? Do you have anything to add? Comments? Feedback? Suggestion? I’d love to hear what you have to say, so leave a comment below. And if you’ve found this useful, please click the share buttons and spread the love. Wow, that was REALLY corny huh? This entry was posted in Blogging, Wordpress and tagged Wordpress. So you haven’t made money online?